Pamukkale is a strange geological formation found in the Aegean region in Turkey. At first glance are a number of full terraced water with high calcium content of incredible beauty: “The tectonic movements that took place in the depression of the failure of the basin Menderes River not only caused frequent earthquakes but also caused the appearance of numerous hot springs. 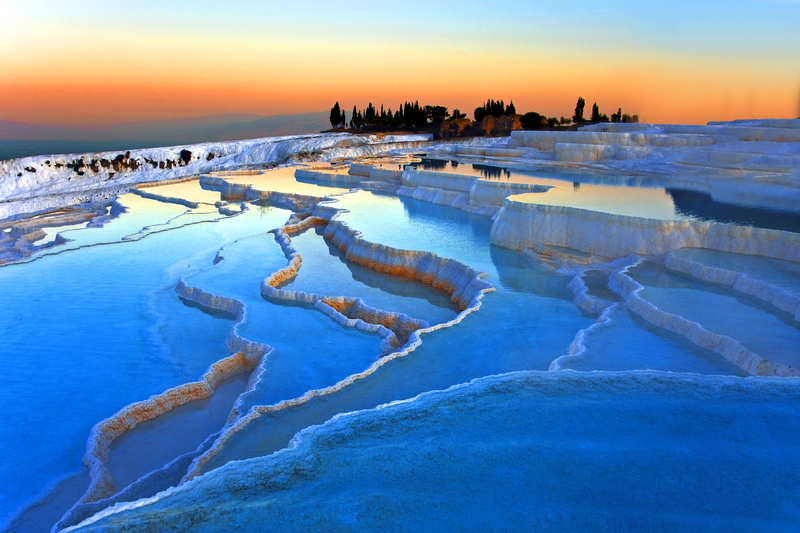 They were those waters, with its high mineral content that created Pamukkale”. Pamukkale is located specifically in the region of Denizli, in the valley of the Menderes River in southwestern Turkey, an hour by plane or 10 by road from the city of Istanbul. Daily visited by thousands of tourists from around the world who come to bathe in its blue waters, which are attributed healing powers, thanks to its high concentration of minerals (components that made these famous and impressive terraces were formed). Cotton Castle: that means Pamukkale in Turkish. And so it is. When standing on his side, ready to climb, you find yourself facing a mountain of fluffy white lime in the middle of a serene valley, very green. Best of all is that you have to take your shoes to move this bathed by hot springs emerging from its top and in its descent, are sedate in natural terraces formed over the centuries surface. It gives the feeling of walking on a pumice stone. For many years, this natural paradise, which began to form in the Pliocene geological period that began more than 5 million years ago and ended about 2 million remained neglected. And evil tourism began to deteriorate. But fortunately, Unesco declared it a World Heritage Site in 1988. Then, several terraces similar to natural artificial pools were built so that people could bathe there, unawares, while visiting this mountain of 160 meters high. The trip from Istanbul takes an hour to reach the city of Denizli (Turkish Airlines and Pegasus Airlines have several flights during the day, and the offer price is very good, from 20 euros the way, if booked in advance). There tourists find different transportation options to get to Pamukkale, including buses and taxis. The most economical: 30 YTL. The ride takes 40 minutes. 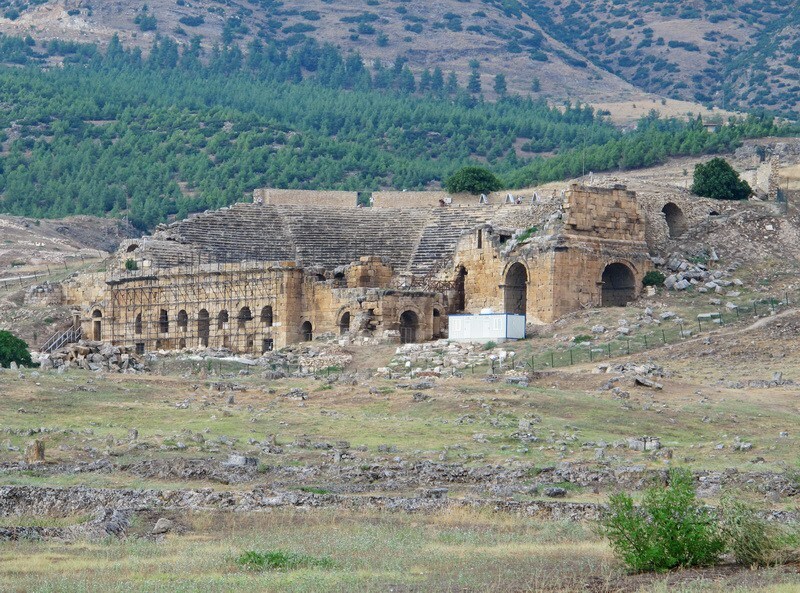 Upon reaching the summit, travelers understand, with astonishment, that there is much more: the ruins of Hierapolis appear on a green plateau which contrasts with the white of the mountain. This was a city of Hellenistic origin (180 BC.) Which became Roman, and its location was an important meeting point of many religions. It was rebuilt several times due to earthquakes. 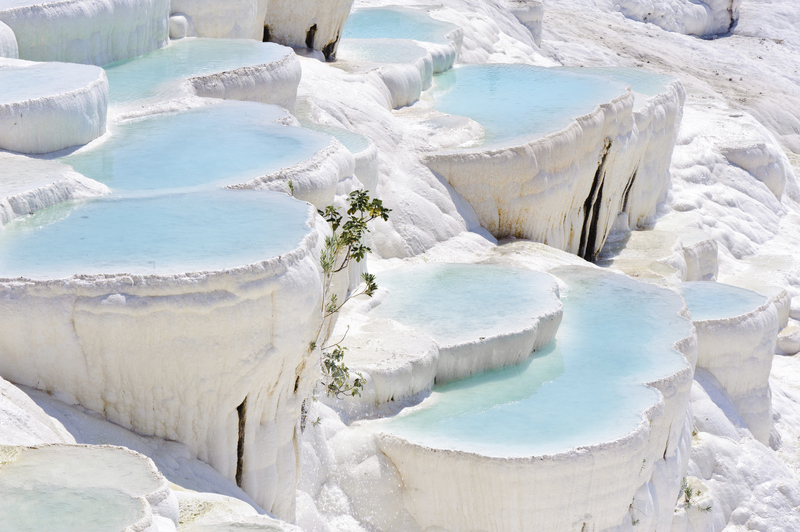 From time immemorial, many patients have sought-and still lost health buscando- in the ‘miraculous’ waters of Pamukkale. The story goes that thousands of people went to live in this land, looking to their woes. But they not all managed and, when he died, were buried here and their tombs became one of the largest and most representative necropolis of Asia Minor. It is important to wear light clothing, sunscreen and good shoes. The tour of Hierapolis may take several hours and includes a theater, baths, the Ninfeo (sanctuary dedicated to nymphs), the tomb of St. Philip, the legendary temple of Apollo three necropolis and the Plutonium, one of the alleged entrances to Hades (Greek underworld). 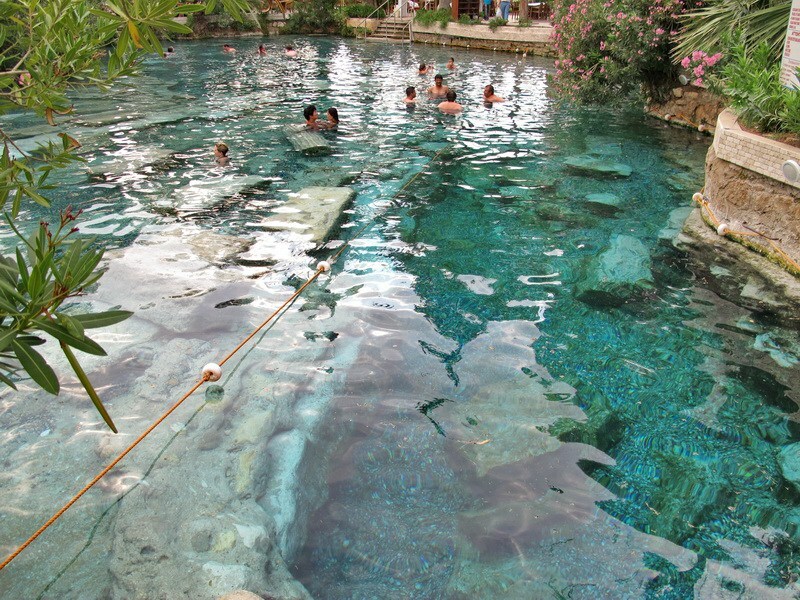 Bathing in the holy pool, which has remains of columns, costs 32 lira. All around there are restaurants, restrooms and souvenir shops, all well prepared to welcome visitors amazed. There the visitor can find all kinds of foods and drinks, sweets made in the region and even the country’s leading beer. If local food such as lamb, bulgur (wheat-based product) or traditional kebabs, does not call attention, there are common dishes like a hamburger and French fries. During most of the year the climate is mild, and perhaps the ideal time to do this tour is between March and October. In May and the following months, the sun sets between 8:30 and 9 p. m., so the time is used more. If you want to stay several days, the offer of hotels and hostels is very wide and can find rooms from 9 euros at night. Many people do to watch the sunrise. At the end of the day there is only a sense of placidity. The sunset seduces and strangers with their -orange, blue, gilded- and the warmth of the sun that envelops the region colors. Upon leaving, it comes the magic moment when you wanted to stay there forever. Pamukkale, besides being an extraordinary destination worth seeing at least once in life, not only leaves indelible images and moments to treasure: walking barefoot there, travelers are reconciled with their feet.